Review posted March 5, 2018. HarperAudio, 2017. 8.75 hours on 7 discs. 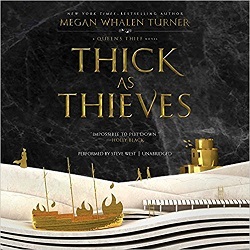 This is now the third time I’ve read Thick as Thieves, and I don’t get tired of it. As with all of Megan Whalen Turner’s books, I discovered a few more nuances each time. But the audiobook version has the advantage of being read by my new narrator-crush, Steve West, discovered when he read Strange the Dreamer. I could (and do) listen to his voice for hours. He delineates the characters well with different voices. Although the audio version doesn’t have a map, I didn’t feel like it was dragging as I listened to his narration – it made each episode that much more interesting. And there’s probably not much more I need to say. This is the fifth book in one of my very favorite series. It’s got adventure and danger and characters you root for. And has an outstanding narrator as well. I do recommend reading the books in order, beginning with The Thief, but let me say that they also make outstanding family listening.